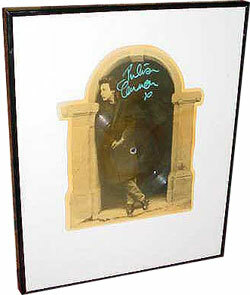 All Julian Lennon items listed below are authentic and very limited. We do not carry multiple items. All prices and availability are subject to change. All prices include shipping and handling for all USA customers. All other destinations will require actual shipping cost to complete transaction. Have a question? Ask us before purchasing the item. Thank You. Description: Limited Edition Valotte UK Odd Shape Picture Disc. Signed in blue paint pen framed in a black metal with glass. Note: Item signed on Julian's 1985 US at the Plaza De Americas in Dallas Texas. 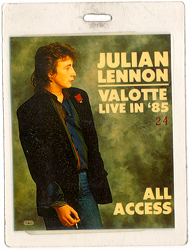 Description: 1985 Julian Lennon Valotte World Tour Band Laminate. Official Tour laminate owned and used by sound engineer David "Cowboy" Conyers. Item is VG+ condition. Limited item. 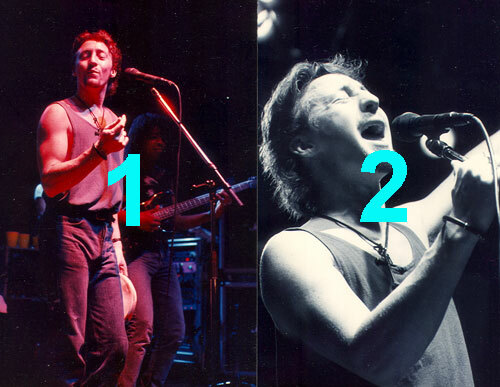 Description: 45 Original Julian Lennon photos taken on his 1989 Mr. Jordan Tour at Dallas Alley in Dallas, Texas. Complete 4x6 photo set $89.99 Total Cost. Shipping Included. 42 photos not snown.